The Coming Depression: The Dollar: Soon to Swoon? Reports of the demise of the U.S. dollar may be premature. But when some of the world's most powerful investors are warning of the currency's decline, investors take notice. Berkshire Hathaway (BRKA) Chief Executive Warren Buffett warned in a New York Times op-ed on Aug. 19 that the U.S. debt load threatened to turn the U.S. into a "banana republic economy." A flood of greenbacks from the Federal Reserve and the Obama and Bush Administrations may be necessary now to prop up the ailing economy, Buffett said. But the government must control its debt in the future—or risk the consequences. "The dollar's destiny lies with Congress," Buffett wrote. On Aug. 20, the head of the world's largest bond fund, Pimco Chief Executive Mohamed El-Erian, sounded as though the dollar's decline were a foregone conclusion. "The question is not whether the dollar will weaken over time, but how it will weaken," El-Erian told Bloomberg, echoing Pimco founder Bill Gross, who has said the dollar could lose its status as the world's reserve currency. "The real risk is that you will get a disorderly decline," El-Erian said. The problem with such bold pronouncements is that the currency markets are notoriously unpredictable. An accurate currency forecast makes a correct stock pick look easy, as it requires foresight into economics, trade flows, capital flows, politics, and market psychology—all on a global scale. In the late 1980s many worried the U.S. dollar was losing out to the Japanese yen and other world currencies. But those worries were quickly forgotten in the 1990s as U.S. deficits narrowed and growth heated up. Last fall the value of the dollar spiked as the world sought refuge in its strongest currency. That had little to do with economic fundamentals. Ironically, it was a U.S.-born financial crisis that was causing investors to push their assets into U.S. dollars. This is an especially treacherous time for currency prognosticators. "I've never known a period when there were more different views about a wide range of different factors in global economics," says Giles Conway Gordon, co-chief investment officer at Cogo Wolf Asset Management. For example, forecasts for the value of the euro vs. the U.S. dollar are all over the map. The shared European currency fetched $1.43 in trading on Aug. 20. Some respected commentators, Gordon notes, are predicting that by the end of the year the euro will be at $1.12, while others are predicting $1.60. "There are huge variations," he says. One wild card remains the financial crisis, which continues to bounce currencies around, says Jessica Hoversen, analyst at MF Global (MF). The dollar, still viewed as a safe haven, inevitably rises on days that investors are more skittish and stock markets fall, she says. For most investors, the crisis isn't over. "They're still very cautious," she says. Another big factor for dollar-watchers is politics. Governments have ways of subtly and not-so-subtly pushing currencies up or down. 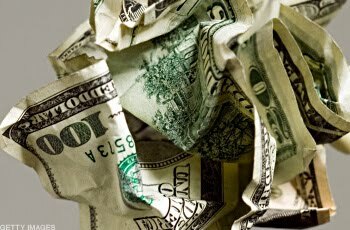 "It's in nobody's interest to see a substantial weakening of the dollar," says Brian Dolan, chief currency strategist at Forex.com, a division of Gain Capital Group. Yes, a weaker dollar would help American manufacturers sell goods overseas, increasing U.S. exports and allowing U.S. companies to report stronger profits from abroad. But a weaker buck would hurt global businesses that import into the U.S. And a softer dollar usually increases prices of commodities, such as oil, which are bought and sold in dollars. "If the dollar were to weaken, commodity prices would increase fairly rapidly," Dolan says. In the U.S., "that would hamper a consumer-led recovery." In the longer term, panics and politics may be less important for the dollar's future than economic fundamentals. This is Buffett's point, with his concern about America's fiscal situation. It's also reflected in worries that the U.S. dollar is losing its preeminent status among global currencies. One counterpoint to these concerns is the reality that currencies trade on a relative basis. "We're not alone in running up these massive deficits," Dolan says. Also, as many observers have pointed out, the rush into dollars during the financial crisis demonstrated that, for now, there are no viable alternatives to the U.S. dollar as the world's preeminent currency. Though inflation could hurt the U.S. dollar, economists and other observers say it's difficult, perhaps impossible, to suffer inflation in an economy hit this hard by an economic downturn. "There is no present danger of inflation," says University of Virginia professor Herman Schwartz, author of Subprime Nation: American Power, Global Capital, and the Housing Bubble. With so many factories idled and so many Americans out of work, the economy has plenty of excess capacity before inflation starts to threaten the dollar's value. "We've got a long way to go before we get there," Schwartz says. That doesn't mean Buffett wasn't right to warn investors and policymakers that inflation could eventually sap the value of the dollar. Schwartz sees Buffett's editorial as a "warning shot across the bow of the Administration." The federal government needed to pump money into the economy, says Cornell University professor Jonathan Kirshner. "We did the right thing and prevented the economy from totally cratering," he says. "But this leaves in its wake serious issues." The solution to the heavy U.S. debt load isn't to slash spending or hike taxes now, he says. Doing so would hurt the economy. Rather, President Barack Obama needs to show over the next couple of years a "path to sustainability"—a plausible scenario whereby the U.S. can begin to pay off the big bills racked up in 2008 and 2009. The future of the U.S. dollar may well be determined by simple, big-picture questions: What will U.S. inflation or economic growth look like, relative to other countries? But the currency markets are also places where subtlety and nuance matter. For example, a gradual decline in the dollar would do less damage than a rapid drop—and might even help parts of the U.S. economy in the process. Like other investors, Buffett is hoping that Obama and other policymakers have the requisite skill to navigate an economy beset by ballooning deficits and subpar growth without doing damage to the U.S. currency. That will be a tall order.